The phrase “I know it when I see it” is rather cliché and typically unhelpful. It is also frequently true: there are phenomena that are easy to observe and record, but actually defining them is a struggle. For instance, physicists cannot agree on a Grand Unified Theory despite broad agreement on its components; philosophical debates can get terrifyingly heated; and the legal definition of obscenity is literally “I know it when I see it.” Similarly, in Magic, it can be easy to “see” overpowered or broken cards, but meaningfully defining these ideas is extremely difficult. During a weekly Modern tournament at my LGS, another player observed that Modern seems much faster and more unfair to him since Bloodbraid Elf and Jace, the Mind Sculptor were unbanned. The observation sparked a lengthy discussion that really didn’t get anywhere before the next round started, and the issue was dropped. However, I haven’t been able to let the idea go. Today, I’m going to reexamine the meaning of fairness and then try answer the title question with actual data. When you ask players what it means to be unfair, they tend to give some variation of “I know it when I see it.” They’ll also give this answer for what fair means, infuriatingly enough. When I’ve pressed those players, I’ve been given wildly differing opinions on exactly what those terms mean, but there are a few common threads that I’ve gathered together to form my own definitions. When players talk to me about playing fair Magic, they always circle back to the gameplay from the starter kits that were part of the old core sets. You play one land a turn, draw one card a turn, pay the full mana cost of your spells, and if you want to do more than that you have to pay an appropriate price in mana. This style of play encapsulates the slow and grindy, but easy to follow and learn, gameplay that Wizards pushes on newbies to help them learn the game. The logical next step is to define unfair as the opposite of fair and go to lunch. However, that’s not a useful definition. By that measure, almost every tournament-caliber deck is at least a little unfair. And fair enough, that’s usually why they’re played in the first place. However, a definition that broad is useless. If it includes too many things, it’s not really defining anything. Granted, unfair Magic does involve breaking the rules, but in what way or to what degree? Doing something that breaks the rules isn’t enough. To be truly unfair, a deck has to be deliberately unfair most of the time. Playing a card that draws extra cards for little price is not fair, but if the rest of the deck follows the rules, then on whole it’s still fair. If instead you build the deck to really take advantage of drawing extra cards for no cost, then you’re in unfair territory. The more rules you break to make your deck work, the more unfair you become. I see fairness as a spectrum. On the far fair side we have decks like pre-Bloodbraid Jund or Jeskai Control. They contain powerful cards and value efficiency, but play very close to the rules. Moving along the line, you have decks that utilize some cheats, but maintain a fundamentally fair gameplan. As you approach the midpoint, you get into the ambiguous zone. I’ve discussed this area in the past and have always struggled to define it. Decks in this region are either doing something fundamentally fair in an unfair way, or are doing something unfair through fair means. Playing ramp strategies is reasonably fair; using ramp to perform a combo kill is not. Hard-casting huge creatures is fair; generating seven mana for Karn Liberated on turn three is not. Dropping aggressive creatures and pumping them up is a fair strategy, while dumping your entire hand in two turns and then attacking for 20 flying damage is not. After this zone, you have the truly unfair decks. These rely on breaking rules to win. There are plenty of combo decks here, but this is also where you’d find the Eye of Ugin-powered Eldrazi decks from 2016. Here’s a graphic to demonstrate: An interesting sidenote is that planeswalkers are hard to place on this spectrum. On the one hand, their initial effect is extremely fair: you pay the mana cost then use an ability. If compared to a spell, that is perfectly fair, especially considering how marginal a lot of planeswalker abilities are for their mana cost. However, the point of planeswalkers is that they remain in play and continuously generate advantage. This moves things towards unfair in my opinion. By how much and how quickly is the question, and I have no answer. It may simply be that planeswalkers are neither fair nor unfair. The other thing to remember is that power is just power. Tarmogoyf is undercosted and incredibly powerful. It is also vanilla creature that only attacks or blocks, and is a perfectly fair card. The fact that it’s better than anything else at that job has no bearing on its fairness. Wizards is always tweaking power levels. What is too powerful today can easily be par for the course tomorrow. Obviously, brokenly unfair cards are incredibly powerful, but so is Thought-Knot Seer. As a four-drop, that card is powerful, but fine; alongside the unfair mana acceleration of Eye of Ugin and Eldrazi Temple, it becomes busted. Therefore, raw power or efficiency is irrelevant as far as fairness is concerned. That the metagame is moving is an accepted fact. The return of Jund to prominence after nearly disappearing last year is proof enough. However, how exactly it is shifting and where the metagame is actually moving is unclear. Raw metagame data is unstable, and the picture I’ve gotten shifting through results is too muddy to deal with, so I’m going to simplify things to make it all comprehensible. Is there a difference in fairness from the pre-unban metagame to the current one? To answer this question, I’m going to take the 10 Tier 1 decks from before the ban and compare it to the current top ten decks from MTGGoldfish. I am sorting these based on my criteria of the unfair component being critical to the operation of the deck. Most constructed decks cheat in some way (that’s why they’re playable); it’s just a question of degree. For example, Death’s Shadow decks cheat on mana cost thanks to delve, but they have to do a lot of setup work, and that keeps them out of the ambiguous zone, even if it’s just barely. Similarly, abusing hexproof and denying the entire concept of interaction is the entire point of Bogles, and this rule-breaking pushes it into ambiguous fairness, if only barely. However, trying to define exactly how or where the decks fall introduces a lot more personal opinion than necessary, so I will stick to the broader categories. There’s enough of that just in assigning categories. In December, there were four unequivocally fair decks, five ambiguously fair decks, and a single unfair deck. At the moment, there are five fair decks, three ambiguous decks, and two unfair decks. That’s not substantially different. It is interesting that there’s an additional unfair deck, but the sample is now primarily fair. This is still too little data to draw a meaningful conclusion, so I will expand into Tier 2. This is a stronger result. The old Tier 2 metagame had five fair decks, three ambiguous decks, and two unfair. The current one has three fair, five ambiguous, and two unfair decks. That is a noticeable change. Going into Tier 3 adds two fair, three ambiguous, and five unfair decks for the old meta and three fair, three ambiguous, and four unfair for the new. Overall, I don’t think this data actually means anything. Taken together, the old metagame same had 11 fair decks, 11 ambiguous decks, and eight unfair, while the new one has 11 fair, 11 ambiguous, and eight unfair decks. In other words, the data as a whole shows no change. Therefore, it does not support that the metagame is more unfair, making the answer to my starting question “no.” If it is perceived to be less fair, I believe that comes from seeing primarily Tier 2-3 decks, which had far more truly unfair decks in both time periods. 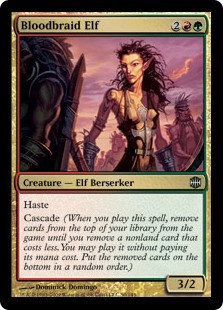 Is Bloodbraid Elf a fair card? If it isn’t, does that make a deck built around it or at least made to exploit it unfair as well? I ask because Jund used to be the paragon of fairness in Modern, but I’m not so sure anymore. A 3/2 with haste for four mana is fair, but making additional mana is not. With cascade, Bloodbraid generates 1-3 mana and a card for the price of the 3/2 with haste. Having an unfair element doesn’t necessarily mean a deck is unfair or even ambiguous, but building your deck around such a card does move a deck in an unfair direction. Comparing current lists to older ones reveals an incredible amount of change meant to maximize Bloodbraid’s potency. If you count Bloodbraid as an unfair card, then a number of decks have moved closer to unfair status. RG Eldrazi is primarily a fair deck, but the mana acceleration from Eldrazi Temple makes it less fair. Counting Bloodbraid as unfair may move it into ambiguous status. This does not mean that it actually is unfair; I’d have to examine it more. Still, the picture is muddier than before. Regardless of the actual trend in the format, it is clear to me that Modern is still in flux and unlikely to settle for some time. There has been tremendous change in Tier 1 according to this data, and that has a cascading impact on every other deck. We won’t know with any certainty what the metagame is actually doing for another few months. My advice in the meantime is to enjoy the breathtaking diversity it while it lasts, as I believe the format will become solved eventually. The question of whether Bloodbraid is a fair card or not is an interesting one. I lean toward no, mainly because of cascade circumventing the “pay mana to cast your spells” aspect of fair Magic. It primarily sees play in fair decks, but that does not make the card itself fair. Personally I view BBE as extremely fair. It’s a creature and something else, a classic 2 for 1. Sure it’s a good rate, but that doesn’t make it unfair, just like Tarmogoyf isn’t unfair just because it’s big for its mana cost. BBE generates card advantage in a manner very similar to Pia and Kiran Nalaar, for instance. I agree with Graeme. In a format with TKS, Gifts, and JTMS as common 4-drop options, no way is a 3/2 haste for 2RG a good rate. Cascade obviously offsets that, but the mechanic’s randomness helps balance it out. True, a 3/2 with haste for 4 isn’t playable, but that has nothing to do with its fairness. Remember, power doesn’t matter. It’s whether the mechanics break the rules of the game. Cascade lets you play a random spell off the top of your deck at no additional cost. Free mana is an unfair mechanic. Whether that makes Bloodbraid an unfair card is the question. The thing everyone forgets about BBE is that a 3/2 haste is not even close to being worth 4 mana in two colors. It was a bit closer in 2009 when creatures were weaker, but today there are numerous 3-power haste creatures with upside for 3 mana, very few of which saw play in Modern either before or after the unbans. The closest comparison to BBE-minus-cascade is the 2 mana Spike Jester, a french vanilla 3/1 haste for BR. BBE doesn’t give you a spell “for free”; the value of the cascade is priced in, and it just isn’t a good card if you don’t build a deck around it to get consistent cascade value. This is why Temur All The Unbanned Cards jamming Jace, Bloodbraid and Ancestral Vision together doesn’t put up results. Such a deck doesn’t want to run normal <4CMC counterspells because they're 100% dead cascade hits (Jund's discard spells and Ponza's mana dorks are the respective decks' worst cascades and are still better than literal blanks) but without them its early interaction is limited to burn spells and the anaemic Izzet Charm. Successful BBE decks (whether Jund, Ponza or Gruul Eldrazi) work because the cards they run are all naturally good cascade targets, while Temur has to cripple itself to support the mechanic. TBH that Temur deck just needs to splash Wild Nacatl for early pressure and Bitterblossom in the side for midrange (and growing Goyf past Reality Smasher) and it would be fine. A Valakut or two might help beat grindy decks too. Interesting idea. But that means adding two colors (white for nacatl and black for BB). Isn’t traverse death’s shadow just better then? You do realize that Murphy’s Law dictates that this deck now exists and will 5-0 a league right? Your going to have a hard time convincing people jund is unfair.. Again i feel like this is an article derived from your personal bias towards bloodbraid elf.. I agree with the above comment from Graeme and mudanhonnyaku.. I feel the extra value is payed for in the 4cmc. Its just a good example of a 2 for 1. And of course it’ll be built around. That’s the only way to maximize the value. I’m not saying Jund is unfair. I am asking the question of whether playing an additional card off the top of your deck for free is unfair. Free mana is generally an unfair mechanic, but does that necessarily equate to an unfair card? I don’t know, but it makes me wonder. I fail to see how that question is interesting. Your definition of fair/unfair isn’t a bad one, but honestly, what is the point of trying to define if something like, lets say, Infect or Affinity, is fair or unfair ? You will need very specific answers to each strategy anyway. I appreciate the time invested in this article, but I do think it could be used better elsewhere. Especially considering we just had a similar article about the format’s speed. Had a similar feeling of deja vu as well. Especially seeing the comparison based on the list of top 30 decks (tier one two and three). The odds an unbanning would create entirely new decks is slim, as are the odds of it meaningfully pushing something out of tier three. Both this and the speed article would have been more compelling if they looked at top results of recent events in order to compile metagame shares (I assume mtgo cant be used for this anymore due to how data is released). Even if its just a four tournament sample size it means so much more to say the actual top tables went from 30 percent fast or unfair to 50 percent, rather than saying of the top x decks overall 7 were unfair and now 8 are unfair. Without weighting for actual presence/share its just not an indicator of anything. Esp in tier three where we’re adding ten decks that combined have less share than any tier one deck, but each counts the same value as that tier one deck. I think the easier question to answer is what decks have suffered or been pushed out recently – ie is mardu pyromancer still a thing? Or conversely what decks are well positioned now. I think we’re going to see some serious changes in the format with dampening sphere. A two mana rock that anyone can play that neuters storm, tron while doing splash damage to decks like grishoalbrand, snapcaster decks, ad nauseum, eldrazi, etc has to matter. I think there’s an interesting parallel here between TKS and BBE. In each case, you’re paying 4 mana for an arguably below the curve creature (4/4 vanilla vs 3/2 with haste) and generating one “virtual card advantage point” over your opponent. I think if TKS is fair, BBE has to be considered fair as well. This does make me want to ask if the goalposts of fair can be moved as a format grows and matures, or if what moves is strictly the goalposts for being considered overpowered. If the definition of fairness is indeed fluid, it might help explain why it’s so hard to define it in words. When you Bloodbraid into Ancestoral Vision it’s not a fair card. I would like to thank Dave for his continued contributions. I view each article he writes for us as a gift. We know he has a job, a family, and aspirations to compete in Magic events, and yet with all these demands he has also undertaken to provide insights and entertainment to us on a regular schedule. This earns him both my respect and admiration. I am motivated to share these thoughts by the comments of earlier writers expressing the view that they failed to see how the question was interesting, or that this article was too much like a previous one. If I overheard friends or family complaining to someone who had just gifted them that it could have been better, I would be appalled. I would try to show them that such complaints are insensitive, and callous, as they devalue the thought, time and effort that the gifter has invested. Regarding the article on “fairness”, Dave illuminates an essential point, that there is a spectrum of fairness and unfairness, and that there is a middle ground where the game plan of a deck incorporates both fair and unfair elements, so that the categorization is ambiguous. In order to progress in this direction, we need to agree on a means to quantify each deck, and assign an unambiguous value, so that the results for decks with a fairness of 0.8, 0.6, 0.4, and 0.2 and be compared and analyzed. I think that we also need to recognize that “unfair” has become a catch-all term for decks that operate on many different axis, and that many decks can be “fair” on one axis, and “unfair” on another. As an example, many people consider Burn an unfair deck because its primary means of killing does not use combat damage, and the many cards that remove or block creatures are not useful. In contrast, the Storm deck that deals lethal combat damage by creating a very large number of creatures by “going-off” in one explosive turn with Empty the Warrens is still not a fair deck. It is just unfair in a different dimension. Additionally, “unfair” has a negative connotation that is undeserved. It is “unfair” to stigmatize players who choose to circumvent expected interaction by using perfectly legal, albeit unconventional, mechanics. So as our understanding deepens, I would like to supplant “unfair” with terms that are more descriptive and precise. I would like expand on concepts explained by Sean Brown in his excellent article “The Unfair Mana Base”, which MTGGoldfish shared with those of us on this continent on 30-Mar-18. Sean’s breakthrough is that “fair” decks are going to have to sculpt their mana curve to “curve-out” efficiently, and that this leaves a recognizable imprint on the mana demands that their cards make. On the other hand, “unfair” decks need to accommodate the specific needs of their combo, and “curving-out” needs to be subservient, and this leaves a different imprint on the mana demands that their cards make. Sean uses the well-studied, and widely used Gini Coefficient, from economics, to construct what he calls the Mana Uneven Index (MUI). Applying his concepts requires recognizing that the actual mana cost of specific cards differs from their CMC. Snapcaster Mage is almost never a two mana card, because you want to use its ability to flashback a 1 or 2 mana spell, so that its actual mana cost is 3 or 4. Grapeshot in a UR Storm build is not a 1 mana spell, because you only intend to play it after you have already cast 14 one-mana spells, so that it is actually a fifteen-mana spell. With these and similar adjustments, one can calculate a value for each deck’s MUI. I have calculated the MUI for a number of modern decks, and classified them as Even, Uneven, or Delayed. The decks with an MUI less than or equal to 0.25 correspond to what we think of as “fair” decks, in that they are “curving-out” there mana requirements. The linear, aggro decks GW Bogles, 5C Humans, and Burn are here. Dave identified Bogles as Ambiguous, rather than Fair, but in regards to its mana requirements, it is low to the ground and does not distort its mana needs to accommodate a combo, so it is an “Even” deck, regardless of whether it is “fair” or not. The decks with MUI greater than 0.38 are Uneven. These decks are capable of winning, in one explosive turn, from what might appear to be a losing position. The usual suspects are here, Living End, Affinity, Tron, Valakut, Storm, and Ad Nauseam. Counters Company can make infinite mana, search its deck for Walking Ballista, and kill you on the spot, so it is no surprise that it shows up here as well. Jeskai Control may seem out of place, but the combination of zero mana Ancestral Vision, and Emrakul, the Aeons Torn create a large MUI, and cheating Emrakul, the Aeons Torn with Nahiri, the Harbinger provides the “Oops, I win” combo that we expect from “unfair” decks. So, in my opinion, it belongs in this company. The “Delayed” category includes the decks that utilize zero mana cards, and/or some large mana cards, that delay the mana requirements of the deck, and inflate the MUI. These decks will start out with a “Fair” game, but are attempting to leverage a game resource to end the game. RG Ponza is trying to ramp into big spells, Grixis Shadow is leveraging its life into a giant creature, UW Control plays a Sphinx’s Revelation and an Ulamog, the Ceasless Hunger, which inflate the MUI, but give it a long game. Eldrazi Tron is not Gx Tron. It plays fewer large creatures and more creatures at the four and five mana slots, so its MUI comes in at an intermediate value, and I expect that we agree that it loses some of the inevitability of Gx Tron as a result. But it is ramping into relatively powerful creatures that will take over the game if given enough time. GR Hollow One also appears here, mostly because in this deck, Hollow One is not a 5-mana spell, but more typically a 1-mana spell, and that keeps the MUI low. Now I am not asserting that this is a “fair” deck. It is “unfair” precisely because it can play Hollow One as a 1-mana spell on turns one and two. But it is not an “Uneven” deck and plays differently from “Uneven” decks. Much like Burn, it comes out fast, but if you neutralize or evade its fast start, you are often favored to win. The “Uneven” decks tend to be slower, but snap their trap suddenly after they have assembled their resources. This use of MUI adds a fully quantitative value to Dave’s semi-quantitative “Fair”, “Ambiguous”, and “Unfair”. It is a value that is derived directly from the structure of the deck, and usefully separates many of the decks that we consider “Fair” and “Unfair” based upon fundamental constraints in deck-building.